Back in April, wrestler Adeline Gray defeated Victoria Francis in a best-of-three final at the U.S. Olympic Trials, securing a place at the 2016 Summer Olympics. 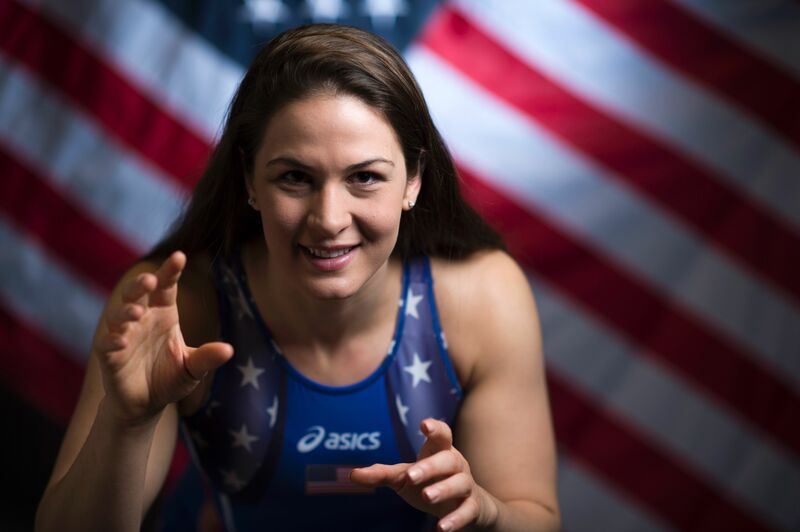 Now in Rio, she could potentially make history: If she were to win the gold in the women's freestyle for her weight class (75 kg), she would become the first American female Olympic wrestling champion. But a gold medal isn't all she's after; Gray has tackled the stigmatization of female athletes in wrestling throughout her career, and she knows winning the gold in Rio could help pave the way for other female wrestlers. "Women's wrestling has now been in the Olympics long enough that Team U.S.A. should have an Olympic gold medal," Gray told NBC's Olympics site. "I'm here to change that. It's so important for our girls. To have young girls be able to look up, that one day they could go and win an Olympic title is huge." This may be Gray's first time competing at the Olympics, but according to Vogue, she is a three-time world champion who has been wrestling since she was 6 years old. Fortune reported that because women's wrestling is still very much a fledgling sport, most of Gray's opponents when she was younger were boys. By the end of her first season, she had won numerous matches and even a state tournament. But being a young female wrestler had its share of difficulties. Gray was unable to join her middle school's wrestling team until her family called the school to protest. Then, when she was on the team, the parents of her opponents often pulled their children out of matches because they didn't want them to "hurt girls." Indeed, much of the stigmatization that girls and women face in wrestling and other contact sports is the apparent contradiction between the sport and their femininity. This misconception is something that Gray and other female athletes like Ronda Rousey have worked to challenge. To become a more successful wrestler, Gray decided that she needed to earn the respect of her teammates and other wrestlers — and she did exactly that. She was on the varsity wrestling team her first year of high school, and by her junior year, she had transferred to a different school and become the captain of the wrestling team. Gray told Vogue that competing against boys early on in her career made her a better athlete, and in an NBC interview, Gray thanked those boys because she wants female wrestlers to be treated with the same respect that male wrestlers already receive. I had an opportunity to train in a sport that I could be an Olympic champion in, and a world champion in, and dream really big for being a female. I'm now a professional athlete that is getting to live an amazing life, and I would have never had that opportunity without those boys stepping on the mat with me every single day and making me better. Those boys made me better, and I want to thank all the boys out there who stepped on the mat, and had the courage to really wrestle me, because I wouldn't be here without them. I would not be standing as a world champion without those people who had the courage to accept women in this sport. Gray has come a long way, especially considering that she was thinking about quitting three years ago. After she didn't make the Olympic team in 2012 and missed out on a world championship in 2013, 25-year-old Gray told The Denver Post that she had thought about retiring. She had dealt with a knee injury and was struggling with her coach Terry Steiner's approach, but in the end, she didn't give up. Now, she's taking her two-year winning streak to the Olympics, and whether or not she keeps the streak going when she competes on Thursday, Gray has already shattered stereotypes and challenged social stigmas for female wrestlers everywhere.